The current initial franchise fee is $40,000, payable when you sign a Franchise Agreement. The estimate for leasehold improvements does not include any tenant improvement allowance that may be granted by landlords towards leasehold improvements. Tenant improvement allowances are site specific and dependent upon several variables, including rent, occupancy levels, and local market conditions, which are beyond Smashburger’s control. This estimate includes freight, installation, and applicable state and local taxes. The cost of acquiring or leasing a location for your Restaurant will vary significantly depending upon the market in which the proposed site is located. A suitable building for a free standing Traditional Restaurant will range in size from approximately 1,600 square feet to 2,200 square feet (up to 600 additional square feet if the franchisor allows a drive-thru component), and will likely cost from $25 to $95 per square foot per year. Lease agreements vary but usually require the lessee to pay for maintenance, insurance, taxes, and any other charges or expenses for the land and building and the operation of the Restaurant, or they may require that you reimburse the landlord for its proportionate share of these payments (plus interest) made on your behalf. Some lease agreements will also require you to pay minimum monthly rent or percentage rent. You must get the franchisor’s approval of your proposed lease before signing it. The rent deposit may be refundable under the terms of the lease. Due to differences in local laws, prices, suppliers, geography, and commercial practices, you may elect to carry a larger inventory. Local costs will greatly affect this investment. In addition to your contribution to the Marketing Fund, you must spend a minimum of $10,000 on a grand opening advertising program that the franchisor has approved. The grand opening program for the first three Smashburger Restaurants includes the obligation to retain a local public relations firm, approved by the franchisor, for three months. The estimate covers the cost for payroll for management and staff training before the opening of your Restaurant (estimate of $6,900 to $40,800). The estimate also includes your costs (including wages, travel, and lodging) to send 3 to 4 individuals to attend the initial training program (estimate of $25,000 to $28,000). Additionally, the estimate above includes an estimate of the franchisor’s costs, which you must reimburse, for sending a lead trainer and/or training team to your Restaurant to provide grand opening assistance. Currently, the franchisor estimates the cost of grand opening training to range from $0 (for your first and second Smashburger Restaurant, because such training is provided free of additional charge) to $30,000 (which is the high-end of the estimate of $6,000 to $30,000 you will incur for your third or subsequent Restaurant). Typical pre-opening expenses include salaries and living expenses for you and your managers in training, training expenses incurred for staff, pre-opening training menus, related pre-opening marketing, and personnel ads. Additionally, you will likely have to prepay or make deposits for various utilities such as gas, electricity, sewer, water, telephone, and garbage disposal. You must obtain state and local licenses, including liquor licenses, business licenses, vending machine licenses, and games licenses. You may have to post bonds in order to obtain certain governmental permits. You must, at your own expense, keep in force insurance policies for each Restaurant. Smashburger reserves the right to change types and amounts of coverage. This estimate is based on Smashburger’s current requirements. 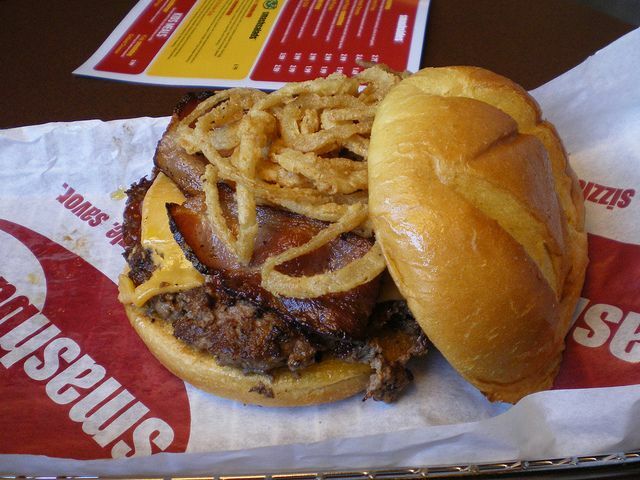 Your lease agreement may require higher insurance limits than those required by Smashburger. You will likely have to prepay all or a portion of the first year’s premiums for insurance. The cost to obtain a liquor license varies greatly depending on the licensing authority involved and the local liquor license resale market, if any. The estimate of the amounts needed to cover your expenses for the start-up phase of your business (i.e. 3 months from the date the Restaurant opens for business) includes: replenishing your inventory, lease payments, initial advertising and promotional expenditures, payroll for managers and other employees, uniforms, utilities, and other variable costs. These amounts do not include any estimates for debt service on the loans that you obtain to finance your business. The estimated initial investment figures shown above for constructing and opening a Restaurant are based primarily on the costs incurred by the franchisor’s affiliates in opening Smashburger Restaurants since the company’s inception in 2008. Because the figures listed above are only estimates, it is possible both to reduce and to exceed costs in any of the areas listed above. Actual costs will vary depending on the physical size and current condition of the premises.